The objective of the present study was to evaluate the effect of the switch of aromatase inhibitors (AIs) on musculoskeletal symptoms in postmenopausal women with hormone-receptor-positive breast cancer. This was a 6-month, prospective, non-randomized, multicenter study. Patients who had discontinued anastrozole due to musculoskeletal symptoms were eligible to participate in this study, and received letrozole, which was initiated 1 month after anastrozole discontinuation. 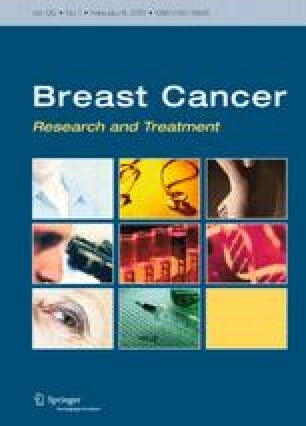 Musculoskeletal symptoms were systematically assessed for severity, location of the symptoms, presence of swelling and of morning stiffness by the oncologist patients when patients stopped taking their anastrozole, 1 month after the discontinuation of anastrozole, and 1, 3, and 6 months after initiating the letrozole therapy. The primary endpoint was the percentage of patients who discontinued letrozole due to the severe musculoskeletal symptoms. After switching from anastrozole therapy, and at the end of the 6-month letrozole treatment, 128 (71.5%) out of 179 patients (61.3 ± 8.4 years) continued with letrozole. Fifty-one patients (28.5%) discontinued treatment due to severe joint pain. At the end of the 6-month, 116 patients (73.9%) had arthralgia, 33 (21.0%) myalgia, 25 (15.9%) arthritis, 22 (14.0%) tendinitis, and 20 (12.7%) polyalgic syndrome. Bivariate analysis of the factors associated with letrozole discontinuation showed that the duration of a prior anastrozole treatment was a significant predictor (P = 0.04). This study shows that in patients intolerant to one AI, switching to another agent allows a higher proportion of patients to continue the therapy and maximize hormonal adjuvant therapy and disease outcome benefits. We thanks the investigators Drs the Dr Boniface-Gelas, Spaeth, Panis, Lucas, Yazbek, Bressac, Hardy-Bessard, Provencal, Fignon, Coeffic, De St Hilaire, Resbeut, Abadie, Krzich, Douadi-Gaci, Audrin, Abboud, Rotarski, Mercier Blas, Beatrix, Karst-Provost, Denis, Facchini, Azria, Mention, Campone, Laplaige, Cals, Delozier, Ellis, Mouysset, Pivot, Lecuru, Malaurie-Agostini, Meunier.